We’ve been in business for 16 years, and we’ve seen a lot of things change in our practices. 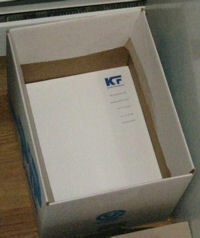 One of those things sits by the file cabinet in the office: the never-ending box of letterhead. There was a time we went through letterhead way too quickly. Inquiry letters, invoices, proposal and contract cover letters… a box would be opened, and we’d roll right through it. But times change. It’s not that the communication has been reduced, because it hasn’t. But few organizations need those items in hard copy any more. And the few things we do print with letterhead, such as some clients’ invoices, have letterhead that is printed from a computerized template in house. But for the most part, invoices, proposals, contracts and cover letters go through email. There’s seldom a need for feeding a special sheet of paper in the printer for a letter now. And so we sit with the last box of letterhead, halfway gone and incredibly unlikely to be used up – and never to be replaced. It’s just not the way we do business any more. « How Do You Actually Use Twitter?